Kate O'Mahony as Little Red Riding Hood. LITTLE RED Riding Hood, this year's Renmore Pantomime, opens at the Town Hall on Friday December 30, and promises to be a spectacular adventure of laughter, music, and song, scripted, as always by Panto Dame Peter Kennedy, and directed by AIMS award-winning twins Brian and Seán Power. If you go down to the woods today... you're definitely in for a big surprise! Not only does Little Red Riding Hood (Kate O'Mahony ) have to look after her poor, old Granny Hood (Peter Kennedy ), she must also contend with the threat of the Wicked Witch Gwendolin (Katie Creaven ) who wishes to cause her harm. With the help of her parents Robin Hood (Karl O'Doherty ) and Marian Hood (Ashling McGrath ), Little Red joins forces with childhood friend Woody (Declan J Gardiner ), the Three Little Pigs (Paul Hughes, Hannah McCreanor, and Michael Cooney ) and the famous Witch Hunters, Prince Hansel (Cathal Ryan ) and Princess Gretel (Jennifer Flaherty ) to overcome the evil witch's curses! This will be the 38th annual pantomime from the Renmore troupe, and will feature well-known Galway performers, electrifying dance routines, and the charming Renmore Smurfs, all bringing sparkle to this seasonal feast of family entertainment - a perennial highlight of Galway’s Christmas calendar. 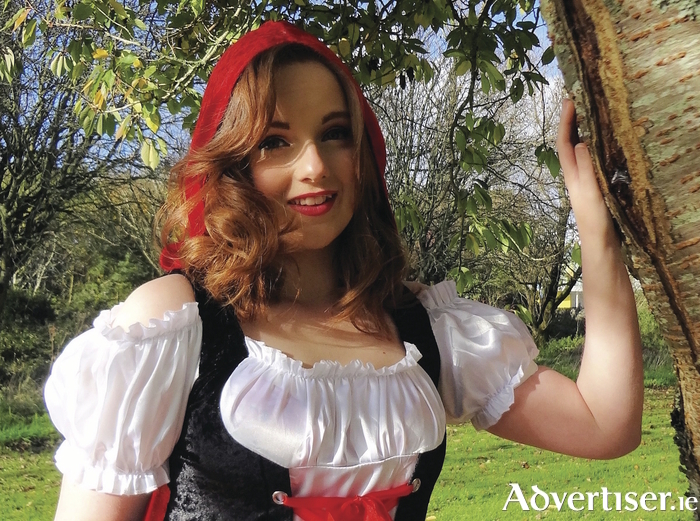 Kate O’Mahony, who plays Little Red Riding Hood, is from Furbo, and is a second-year drama student at NUI Galway. This is her fourth performance with the Renmore Pantomime, having played Princess Pauline in last year’s production of Jack and the Beanstalk. Kate has performed with many societies around Galway including Twin Productions, Galway Musical Society, KATS, 9 Arch Claregalway Musical Society, the Galway Theatre Rooms, Corofin Musical Society and NUIG Dramsoc. Kate describes her character of Little Red: “Peter Kennedy has pulled a nice stunt in making Robin Hood and Maid Marian (Ashling McGrath and Karl O'Doherty pictured above ), Little Red Riding Hood’s parents. In the story we also have the Three Little Pigs and Hansel and Gretel so it’s quite a mash-up of a lot of different fairy tales. Little Red Riding Hood runs at the Town Hall Theatre for 21 performances from the December 30 to January 15. There will be matinees (2.30pm ) on December 30 and 31, and January 1, 7, and 14; Matinees (12 noon and 4.30pm ) on January 2, 8, and 15; and nightly performances (7.30pm ) on December 30 and January 1, 4, 5, 6, 7, 11, 12, 13, and 14. There will be a Sensory Friendly performance of Little Red Riding Hood on Sunday January 8 at 12 noon to cater to the needs of children with autism spectrum disorders and other sensory difficulties.